A.R. Rajaraja Varma profile and biography is given here. A.R. Rajaraja Varma was an astute learner throughout his life. He systematically planned and executed the jobs as a teacher and a writer. Many of his works are considered as the grammar books of Malayalam language. Please go through the life of this great visionary and writer to learn some positive attributes from him and implement them in your life. A.R. Rajaraja Varma was a poet, a critic, and a grammarian of Malayalam literature. He was also the Professor of Oriental Languages in Maharaja's college in the capital city of Kerala. He wrote the scholarly articles on various topics in both Malayalam and Sanskrit languages. He is named as Kerala Panini for his immense contribution to the field of Malayalam literature. From a critic's point of view, Kerala Panini's works reflect the influence of British Romantic Poets of the 19th century and the renewed interest in the real classics of Sanskrit literature. A.R. Rajaraja Varma's such as Kerala Paninineeyam, Bhashabhooshanam, and Vritha Manjari represent the textbook examples of good prose in Malayalam literature. Bhanga Vilapam and Malaya Vilasam are his poetic works. The lovers of art regard the period between 1850 and 1950 as the Golden Age of Malayalam literature. During this period, the stalwarts such as Kerala Varma, A.R. Rajaraja Varma, O. Chandu Menon, Kumaran Asan, Vallathol Narayana Menon, C.V. Raman Pillai, and Ulloor S. Parameswara Iyer lived and enriched the Malayalam literature with their creative works. To be frank, with the correct blend of scholarly attitude and creative talent, A.R. Rajaraja Varma was the moving spirit behind the Literary Renaissance of Malayalam literature in the state. A.R. Rajaraja Varma Koyi Thampuran was born at Lakshmipuram Palace in a place called Changanachery in Kottayam district of Kerala. His parents were Vasudevan Namboothiri of Pattial Illam and Kunjikkavu Thampuratti. When he was two years old, he had to shift to Ananthapuram Palace at Haripad along with his mother and uncle Kerala Varma Valiya Koyi Thampuran. In that palace, he stayed happily playing chess and rendering self-composed Akshara slokas in free time. During this period, he was at his creative best composing poems in Malayalam language. The works such as Rugmini Varam and Devi Mangalam were created during this period. During his childhood years, Rajaraja Varma never showed interest in talking, as he was suffering from stuttering and incoherent speech. In order to rectify this defect, he was made to worship Panachikattu Bhagavathi. A.R. Rajaraja Varma was given formal education under the guidance of Chunakkara Achutha Warrier and Sankara Warrier. Under their tutelage he learned elementary arithmetic and basics in Sanskrit language by the age of 12 years. Later, he continued his studies under his uncle Kerala Valiya Koyi Thampuran. During the six years of education under him, A.R. Rajaraja Varma learned Nyshadham, Manaveda Champu, Kuvalaya Nandam, Shakunthalam, Malathy Madhavam, etc. During this period, he also learned Maha Kavyas, Rasa Gandharam, grammar texts and dramas. By the age of 20 years, he completed matriculation and passed F.A. (First Examination in Arts) exam successfully. After clearing the F.A. exam, Rajaraja Varma joined the degree course in Malayalam language with Chemistry as an optional subject. In the second attempt, he cleared the course. With this, he became the first amongst the Royals to get a degree from Madras University. When he was doing the degree course, he wrote Bhanga Vilapam, Meghopalambam, Sree Padmanabha Panchakam, Veenashtakam, and Pithru Palanam. Almost in the same period, he got married to Swathi Thirunal Mahaprabhu Kochu Thampuratti who was the daughter of Mootha Koyi Thampuran of Mavelikkara Palace. In their marriage, they had eight children. 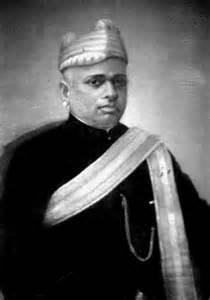 Immediately after passing the degree course, Rajaraja Varma was appointed as an Inspector in the Sanskrit School by then Maharajah of Travancore Sree Moolam Thirunal. For this job, he was getting an honorarium of Rs. 200. While working as an Inspector, Rajaraja Varma introduced Western curriculum and teaching methods to give a new look to the school. By systematically introducing the reforms in education, he could convert the school into a reputed college. During this period, Rajaraja Varma enrolled himself in the Madras-based Presidency College for a M.A. Course in Sanskrit language. Within two years, he completed the postgraduate degree in Sanskrit with flying colors. In fact, he stood first in the examination and had won a Munnuswamy Chetty medal for the same feat. This was the highest accolade an academician could get in South India at that point in time. He also received the Ross Gold Medal for getting first in the postgraduate degree examination. Since he completed his post graduation in style, Rajaraja Varma was appointed as the Principal of the Sanskrit college in 1894. In this period, he could contribute a total of 43 titles, which included 21 Sanskrit and 22 Malayalam works. In 1912, he was appointed as the Superintendent of Oriental Languages in Maharaja's College in Thiruvananthapuram. As a senior-most faculty, A.R. Rajaraja Varma planned and envisioned the courses in his department to help the student community. Because of this, he became a good teacher with a decent student following. Looking at the planning, teaching and organizational skills, he was appointed as the Principle of the college. With this, Rajaraja Varma became the first non-British Principle of the Maharaja's College. A.R. Rajaraja Varma had written many books on grammar and rhetoric. Due to this, he earned the name of Kerala Panini. These books eventually laid the foundation stone for the Renaissance and Enlightenment of Malayalam poetry and criticism. The book written by him Kerala Pananeeyam is considered to be an authoritative work on Malayalam grammar. He wrote extensively on various topics related to literature in both Malayalam and Sanskrit languages. Since he was an avid reader of Western Classics, his works in poetry had the tinge of Western romanticism. A.R. Rajaraja Varma also had the influence of the traditional classical style of the Sanskrit language in his creations. In fact, his creations had the unique and perfect blend of these two styles. A.R. Rajaraja Varma also had laid the foundation stone for the Malayalam literature by setting up guidelines for writing poetry and prose. The guidelines for writing in Malayalam language can be had from some of the books written by him. They include Bhasha Poshini, Sahithya Sakhyam, Vritha Manjeri, Madhyama Vyakaranam, Sabda Sodhini, and Mani Deepika. The English-style punctuation was introduced in Malayalam language by him through his book Vritha Manjeri. Bhanga Vilapam and Malaya Vilasam are his poetic creations. In fact, Malaya Vilasam can be considered as the front-runner of Bhavageetham in Malayalam language. He also has written creative works in Sanskrit language. They are Vitavibharathi, Laghu Panineeyam, and Angala Sambrajyam. To his credit, he has translated titles such as Bhasha Meghadooth, Malayala Shakunthalam, Bhasha Kumara Sambhavam, Charudatham, Malavikagnimithram, and Swapna Vasavadatham from Sanskrit language to Malayalam language. A.R. Rajaraja Varma is considered to be the father of Malayalam literature. He was the celebrated poet, critic and grammarian in Malayalam literature. Through his works, he introduced English-style punctuation in Malayalam writing. Some of his authoritative books on grammar are still considered the bible of Malayalam literature. To his credit, he was completed about 43 titles, of which 21 titles are in Sanskrit language and the rest 22 are in Malayalam language. During his time, he even translated some of the coveted books from Sanskrit literature to the Malayalam language. Moreover, he was a visionary and a neat planner. Because of these attributes, he was given the administrative jobs in the college where he was teaching Malayalam and Sanskrit literatures to students. He was also an excellent teacher who gauged the minds of his students. Due to this quality, he has a long list of disciples.